OroCRM’s Magento Abandoned Cart Campaign (ACC) functionality enables users to receive additional store revenue by increasing conversion of abandoned carts. Segment the necessary carts from all the carts available in OroCRM. 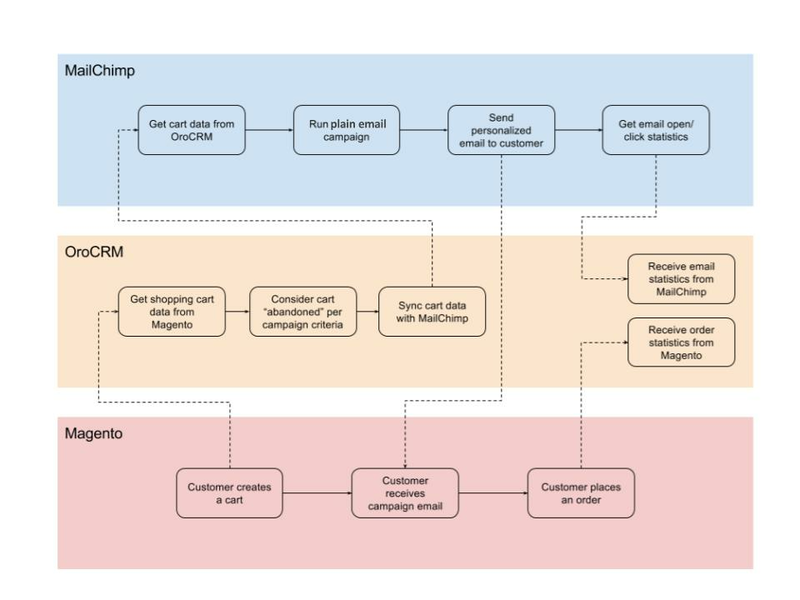 Synchronize customer and cart data with MailChimp. 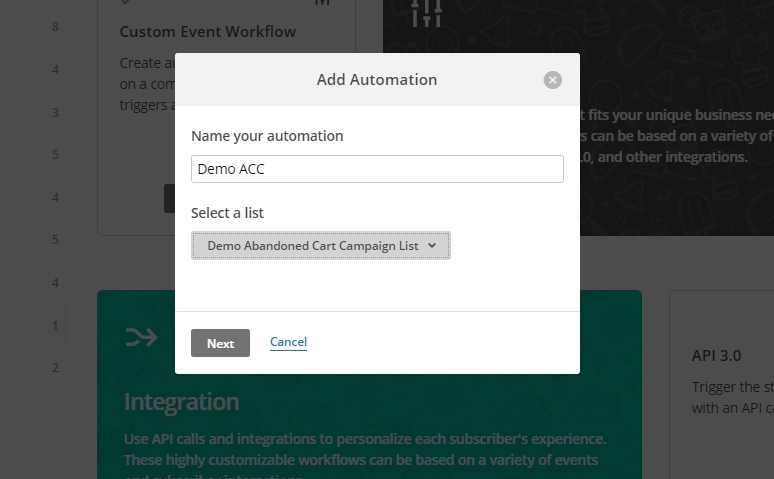 Create an ongoing automation campaign in MailChimp for all carts that become abandoned. Receive statistics on clicks and opens to monitor email campaign effectiveness. Trace orders resulted from the email campaign to evaluate cart conversion and economic benefit. OroCRM supports out-of-the-box Magento Abandoned Cart Campaign functionality for Enterprise and Community Edition users, which means that no additional installation is required. However, if you happen to use a custom Enterprise or Community Edition application without the ACC extension, you can install it separately. For this, use the Composer to install the oro/crm-abandoned-cart package in your Oro application, as described in the Extensions and Package Manager Guide topic. Ensure that your Magento channel has the Abandoned Cart Campaign entity added to the list of entities managed by the channel. Otherwise, Abandoned Cart Campaign entity will not be available in the main menu. It is necessary to have an active MailChimp Integration to be able to send an ACC. See the corresponding section of the Sending Email Campaign via MailChimp guide for MailChimp integration instructions. Navigate to Marketing > Abandoned Cart Campaigns. Click Create Abandoned Cart Campaign in the top right corner. Owner Limits the list of users who can manage the campaign. It is by default set to the user creating the ACC campaign. Description Optional field that can be filled in with details to help you and other users understand the peculiarities of the list in the future. Filters By default, the Status field value is set to Open. If you do not apply any other conditions, all the carts abandoned during the checkout will be covered by the mailing. You can use other filters to choose those abandoned cart records that fit your marketing purposes. For example, this could be carts the belong to customers from a specific state and/or with a birthday within a specific month, carts created after a certain date, or specified with other combinations of filter conditions. More information about the ways to define filters is provided in the Filters Management guide. Columns Defines a set of fields that will be sent to MailChimp and used in the email template as variables. At least one contact information column must be specified. In our case, it is Email. The same fields will be displayed in the grid to visualize the carts that meet the conditions in OroCRM. Details such as names, URLs, etc. are transferred to MailChimp automatically. Once all the necessary fields are completed, click Save and Close. Your newly created ACC appears in the table. As an illustration, we have created a sample ACC and named it Demo ACC. You can see it in the screenshots below. As you can see from the screenshot, the Status field is marked Open. This is a default setting as we are looking for carts that have not been closed yet. This is what qualifies them abandoned. Later, we will be sending and ACC via MailChimp. The cart ID, customers’ last names and emails will be transferred to the MailChimp account for every such cart and can be used as variables for email campaigns. If the cart is converted into an order, it will be removed from the list. If a new cart is abandoned that meets the campaign’s conditions, it will be added to the list. Since we do not want to send email notifications to all abandoned carts and bother the customers in vain, we have chosen to set the earlier than today-3 variable (where “-“ is a minus and “3” is the number of days) as a condition in Filters. This means that we are looking for carts that have been updated earlier than 3 days ago. Note: If we set an exact date as a variable, then within a certain period of time such condition would lose its relevance. That is why it is recommended to use today, today-X, etc. as a variable. When an ACC is saved, a campaign is automatically created as well, and if at this point we go to Marketing > Campaigns, we will see our newly created ACC in the table. General Information General details of the campaign, such as Name, Description, Segment and Owner. Magento Shopping Carts Contains a grid of all abandoned shopping carts that are included in the campaign. Initially, all users on the list are marked subscribed, therefore the value in the Subscribed column is Yes. If a user unsubscribes during one of the email campaigns, the value will change into No and this user will be excluded from the next email campaigns. Removed Items This grid will contain carts that have been removed from the list. A cart may be removed from OroCRM and/or from MailChimp after synchronization. Conversion Items that were initially added to the campaign as carts but later turned into orders. 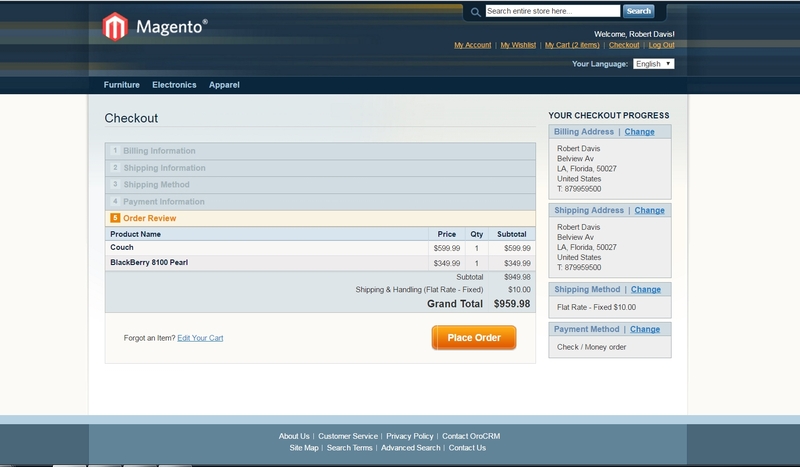 As an illustration for this Demo ACC, we have created a cart on the Magento side but have not completed our order. 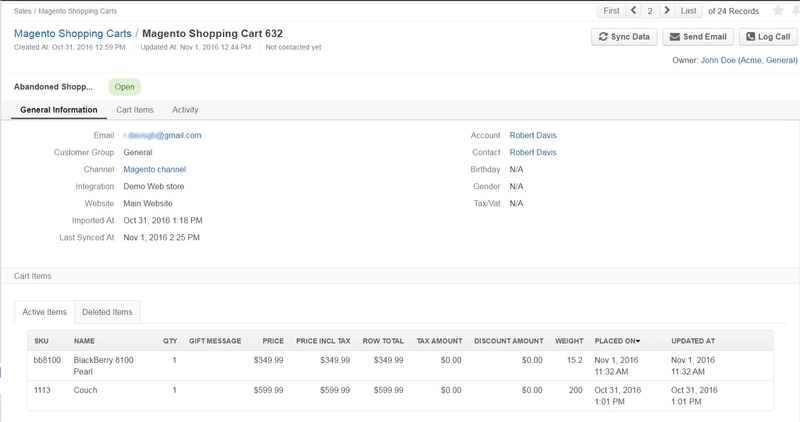 Once we leave the store and go back to OroCRM, an abandoned cart will be created with the customer’s and cart details. Make sure you synchronize your integration by going to System > Integrations and selecting your Magento integration. For Magento Abandoned Cart Campaigns, OroCRM provides an out-of-the-box conversion tool. This means that you can see how many carts have been converted into orders through your campaign. The Url value is the URL address of the Magento store, for which Abandoned Cart Campaign is created. The Channel value is the channel of the Magento store, for which Abandoned Cart Campaign is created. Once you have created such record, it should be available in Marketing > Tracking Websites. We have set up a Magento Channel record as an illustration. A tracking website record allows you to add a Tracking Code to the website to track your campaign-related user activities. The code is located in the Tracking code tab of your tracking website record. Now we have the abandoned cart campaign (Demo ACC) and a tracking website record (Magento Channel) ready. Navigate to the Tracking Code tab. Here, you will see the code of your campaign. 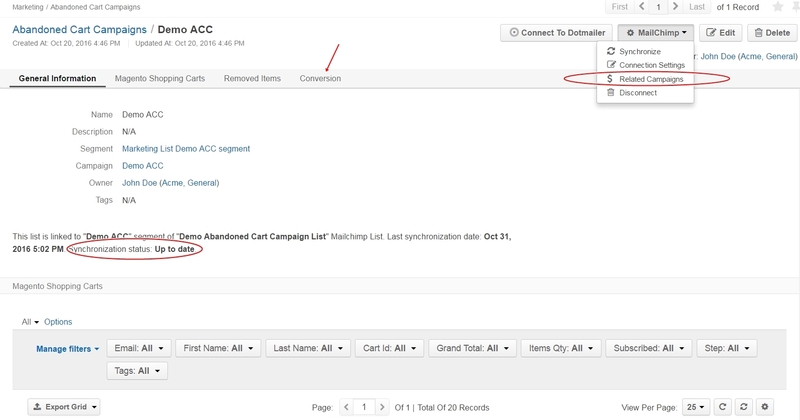 You can assign a tracking website record to your campaign in two steps. You can add the marketing campaign code (see the screenshot above) to the tracking script (e.g. Magento Channel in our case) after setUserId call (e.g. _paq.push([‘setCampaignName’, ‘Demo_ACC2’]);). This code is added to the page of the website that you wish to track before the </body> tag. Each time a user reaches a page with such a code, an event is logged within the campaign. If you have OroCRM Tracking extension installed, this tracking code will be added to your Magento Store for you. You can read more on Magento Web Tracking in the corresponding section of the guide. Add the piece of code from the campaign view page (e.g. ?pk\_campaign=Demo\_ACC2) to the Magento store’s URL and use this modified URL as a link in your MailChimp automation emails. Each time a user reaches a page with such a URL, an event will be logged within the campaign (e.g. http://XXXX/checkout/cart/?pk_campaign=Demo_ACC2). This tracking code will be automatically passed to MailChimp and can be used as a variable in emails. When we start designing our email in MailChimp automation, the campaign code variable will be available on the list of Merge Tags (|E_CMPGN_CD| variable). This code will be synced to MailChimp during synchronization with Oro (see Step 7). Navigate to Lists and click Create a List. Complete the required fields and click Save. At this point, your list should be empty. After OroCRM’s synchronization with MailChimp, an ACC list will be mapped to MailChimp as a segment. You can also map campaign as a segment of any subscribers’ list available to you in MailChimp. Click Connect to MailChimp in the upper-right corner. Select your MailChimp Integration and the list segment on the MailChimp side. Once connected, navigate to the MailChimp button in the upper-right corner. Once the connection has been marked as Up To Date, go back to your MailChimp account. Your ACC should have now been synced to your MailChimp list which will now contain all the users from your campaign along with the details of their carts. Click the Automation tab in the upper menu. Click Add Automation in the upper-right corner. Select Custom from the left-hand menu. Give your automation a name and select the list that we created in MailChimp and synchronized with OroCRM. On the newly opened page, click Edit Trigger. Choose settings for the trigger or click Change Trigger for more options. For our demo campaign, let us assume that we need emails to be sent every time as a new subscriber joins the list. To configure this, choose Change Trigger, open List Management tab and select Signup: A subscriber joins your list. Enable the Trigger when subscribers are imported box. This is necessary for correct interaction between OroCRM and MailChimp during automation workflow. Click Update Trigger when you are finished. Next, we need to add a segmentation condition by clicking Edit Segment. Enable the Choose Segmentation Conditions box. Choose a segment, so that emails are sent to everyone on the ACC list but not to everyone on the subscribers’ list. In our case, it is Demo ACC. If you wish, you can apply certain Actions to the campaign by clicking Edit Actions and ticking Choose Post-Sending List Action. In the dropdown menu, it is possible to select actions that you want to apply to particular subscribers on your ACC list, such as Delete from the List, Unsubscribe from the List, etc. Once you are redirected to the previous page, click Design Email. Click Next in the lower right corner or use the steps at the bottom to redirect you to the next page. You can now design your own email by changing the pre-configured text and information in the template. You can add these variables by clicking Merge Tags in the Content of your email. 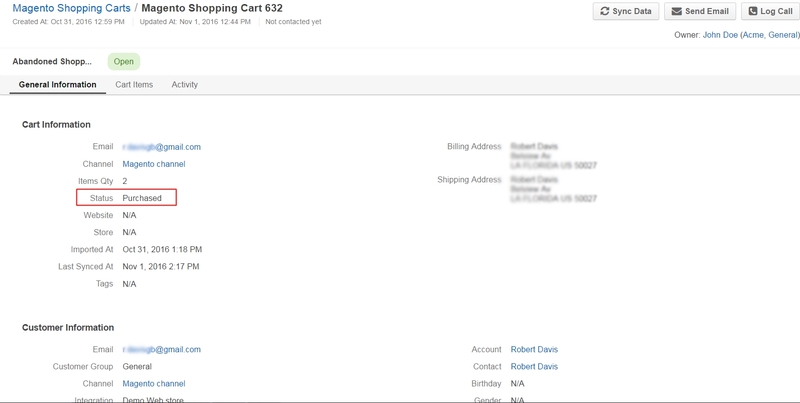 For Cart Items, OroCRM passes information of up to three items in the shopping cart, it does not send all cart items. If there are 5 items in the cart, only information about the first three will be sent. Note, that the tracking code for Demo ACC campaign (?pk_campaign=*|E_CMPGN_CD|* where *|E_CMPGN_CD|* is Demo_ACC2) follows the URL for our Magento Store with an abandoned cart. In the example, this link is attached to the word here in the text (see the previous screenshot). When you are done designing your email, click Save and Continue in the lower right corner. You will be redirected back to the page with your email campaign details. If necessary, here you can add another email that can be sent after a certain period of time (following the first email) to all the users who are still on the list. Click Next when you are finished designing your email and review your workflow on the next page. Click Start Workflow when you have made sure that the email contains all the necessary details and is ready for mailing. Your subscribers should have now received your email with a reminder to go back to their abandoned carts and place their orders. Let us click on the link in the email and place the order. Synchronize your Magento and MailChimp integrations either by clicking the Sync button next to each integration on the View Page, or by opening the integrations and selecting Schedule Sync. Go to Marketing > Campaigns and click your ACC campaign. Statistics should be displayed in the Events tab for your campaign, such as the number of orders placed, number of users entering their checkout and visits. Go to the Marketing > Abandoned Cart Campaigns > Magento Shopping Carts tab. As you can see in the screenshot above, the Status of our abandoned cart is now Purchased. You can also see the purchased items and their details. Users, who placed their orders after receiving your ACC will be removed from the lists in OroCRM and MailChimp. Once automation emails have been sent and integrations have been synchronized, you can enable conversion results for your ACC. The Related Campaigns option will appear in the MailChimp dropdown menu on your ACC page (Marketing > Abandoned Cart Campaigns). Select your campaign’s flow and click Enable Conversion. Information about your converted orders will be available in the Conversion section. Later, if you wish to update the details of your conversions, choose your flow and click Update. Tracking campaign statistics helps update the next ACC campaign according to your needs. For instance, it is possible to set up another ACC campaign to be sent to those customers who have previously placed their orders following an email campaign reminder. To do that, apply the following conditions within conditions group in the Filters section. Magento Shopping Cart/Customer/Magento Customer (Visitor Event)/Web event>Code. The field value here would contain your campaign tracking code (Demo_ACC2 in our case). Magento Shopping Cart/Customer/Magento Customer (Visitor Event)/Web event>Name. The field value here would be ‘order placed’ since we are looking for customers who have previously completed their Magento orders. In similar manner, you can apply various conditions of your choice to help you filter customers based on previous campaigns.